This Santa Fe dog photography session was pretty special, I’m not going to lie. 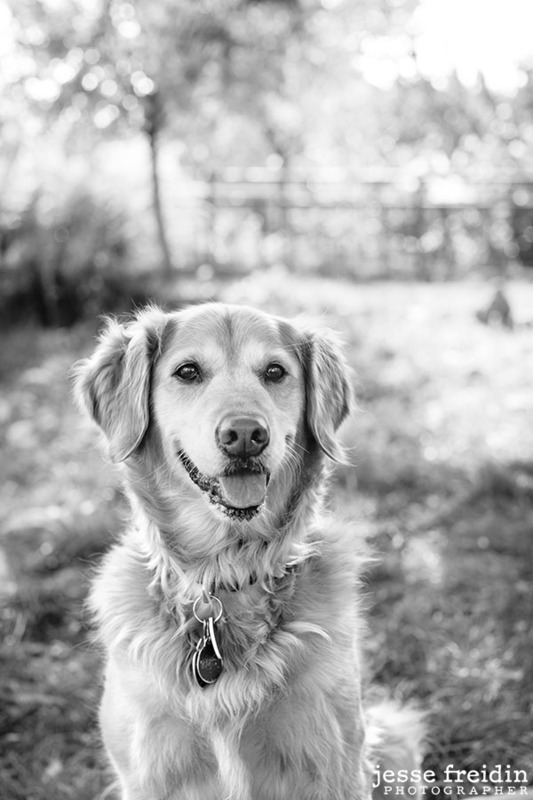 After seeing my featured profile article in the Santa Fe New Mexican that came out last Summer (click here to read that great article), this client got in touch and during our first Creative Call they told me all about their wonderful Golden Retriever, Harper, who was just about to turn 10. During that first conversation - a truly important and inspiring and emotional and fun step in my process of getting to know and understand my dog photography clients - they also mentioned that they both were turning 70 in 2019. In dog years, Harper was technically turning 70 as well. 2019 was to be a big birthday year, and my client wanted to commission me to help them celebrate all that that moment entailed. And I couldn’t have been happier about it. This client lives part time in Santa Fe, and part time in a few other equally beautiful places. When they travel between cities they always drive, of course, so that sweet Harper can safely and comfortably travel with them. She is the center of their world and there is so much love in their family. There also is a beautiful collection of art, which caught my eye when I first entered their home in Santa Fe. Harper greeted me with an enthusiastic body slam, and did a few zooms around the living room to make me feel welcome (as any Golden Retriever would). We spent some quiet time photographing at home, utilize the great window light and simple textures and tones before heading out to a nearby Santa Fe park with beautiful dappled light, grass, murals and space for Harper to run around a bit. Though Harper was hardly slowing down at the ripe old age of 10, she did unfortunately have a cast on during our dog photography session from a stubborn injury that simply would not heal properly. My client was hesitant to even keep our Photography Session scheduled as they did not want to focus on Harper’s cast, but because her injury persisted for months we went ahead and photographed anyway. As is my job, I listened to my clients’ concerns about wanting to avoid the cast in our portraits - they wanted to show Harper at her best, not her worst. Of course I understood, and made sure to confidently and calmly create beautiful, glowing portraits of sweet and happy Harper without showing the cast. I knew we could do it, and we did. However, as is my nature, I was not afraid to create and show portraits that did actually include her full body, and therefore her actual injured foot. 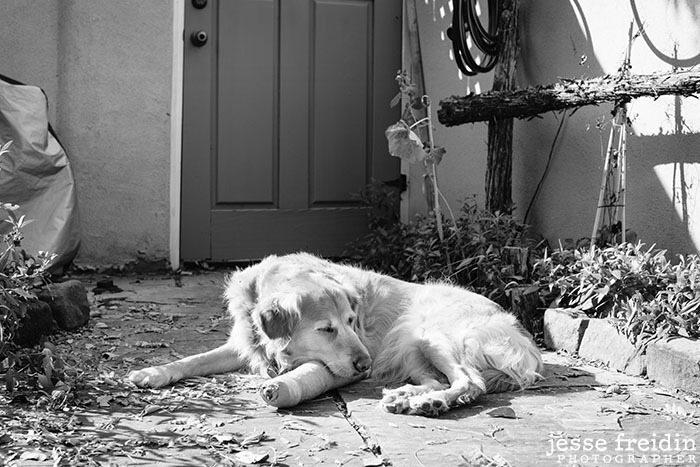 As a documentary dog photographer, I believe all moments in a dog’s life are equally important - even the ones that seem stressful or odd (like a pesky injury). I then left it up to my clients whether or not to fall in love with those images - and, of course, they did. 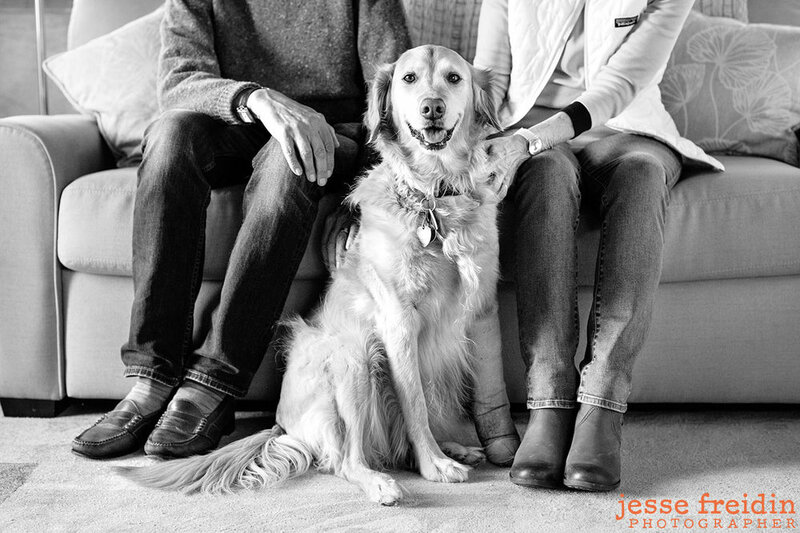 One of the main goals of this Santa Fe dog photography session was to create a strong family portrait that my client could use for their 70th Birthday invitations to friends and family around the world. 2019 would be full of multiple birthday celebrations for all three of them in various locations, and this portrait would act as an anchor for that very special invitation. The portrait above was what the landed on, taken in the late afternoon at a unique little park in Santa Fe. At the very end of our Photography Session, we returned to the house and I could tell Harper was worn out (I very common side effect of a great session). So as I pretended to pack up my camera bag I saw Harper trot over to her favorite sun spot on the patio and curl up for a snooze. This is what always happens at the end of a session if I’m careful - I pretend to pack my bag so that dogs feel as though they are let off the hook and can go take a load off. The trick is to oh-so-quietly keep an eye on where they end up and sneak over there to create a few final portraits - these usually end of being some of my favorite images from a session because dogs are so relaxed, curled up in spots my clients are so familiar with. This portrait above of course became another great edition for my client’s home. Thanks for a wonderful session, Harper. You’re a very good dog.